TNPSC conducts CCSE 4(Group 4 & VAO) exams regularly and no. of the post may vary. Many Students are appearing for the CCSE Group 4 & VAO Exams. Only a few students got selected in TNPSC Group 4 post. The syllabus is the most important thing for any type of exam, take the blueprint of Syllabus. Read CCSE 4 syllabus complete in order to get a complete outline of the exam. Prepare a complete group 4 study plan before start preparing exam. Mark the area you already know an area to concentrate more. Try to read newspapers so that you can easily score in the current affairs part. 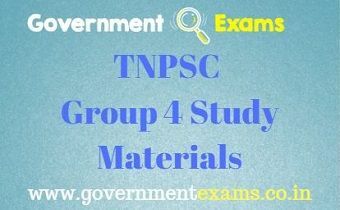 TNPSC Group 4 Study Materials given below in PDF(Tamil & English) Free Download. Note: For TNPSC CCSE 4 Syllabus – Click here. This Page covers TNPSC CCSE 4 (Group 4) 2018 Study Materials for all subjects. Download the Pdf format Study Materials for subjects such as General Tamil, General Knowledge, History, Geography, Indian Constitution and Policy, Economics, Computer Awareness, etc. We are providing you with TNPSC Group 4 Study Materials both English and Tamil. Download previous year Group 4 Question papers by clicking the link – TNPSC Group 4 Previous year question paper. you can go through TNPSC Group 4 Current Affairs. Model Question papers for Group 4 Exam – Click here.